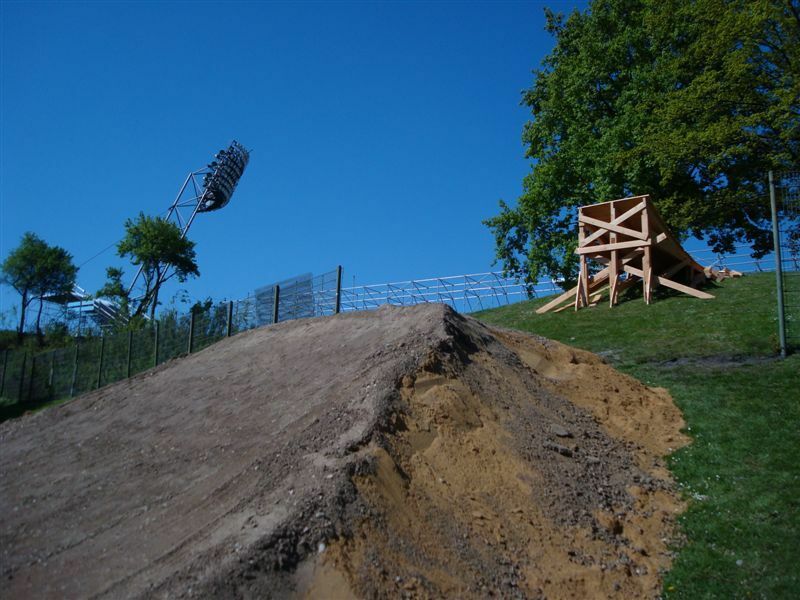 Only 3 days until the first Nissan Qashqai Challenge event in the Olympiapark, Munich – the site of the 1972 Olympic Games. 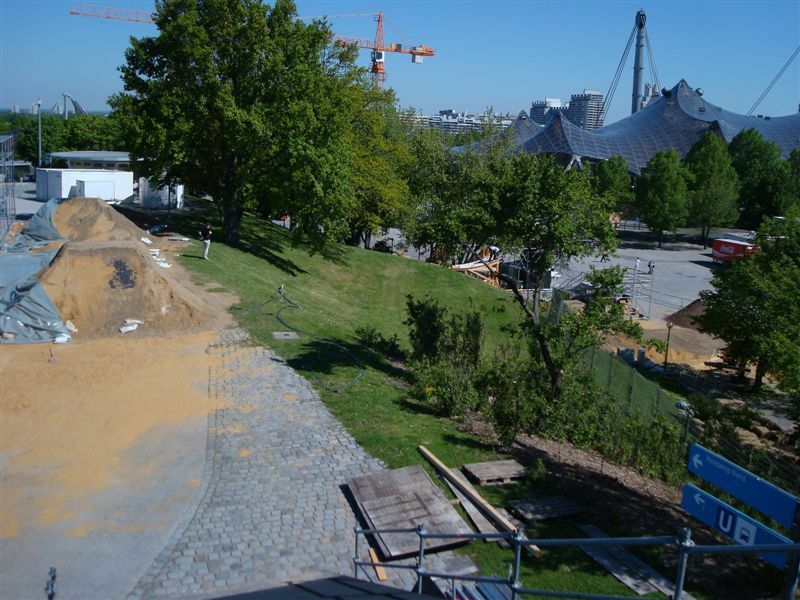 People from all over the world will head to the Coubertinplatz, right in between the Olympic Stadium and the swimming hall in order to watch the world’s best mountain bikers. The level of riding at the first two qualifying events has been incredible, but this weekend is sure to see the best yet as the top 28 freeriders in the world will be at this event. Munich is the first of two final events that will determine the overall Nissan Qashqai Challenge series winner, and with $ 250,000 Dollars up for grabs, definitely the biggest pay out of the season. 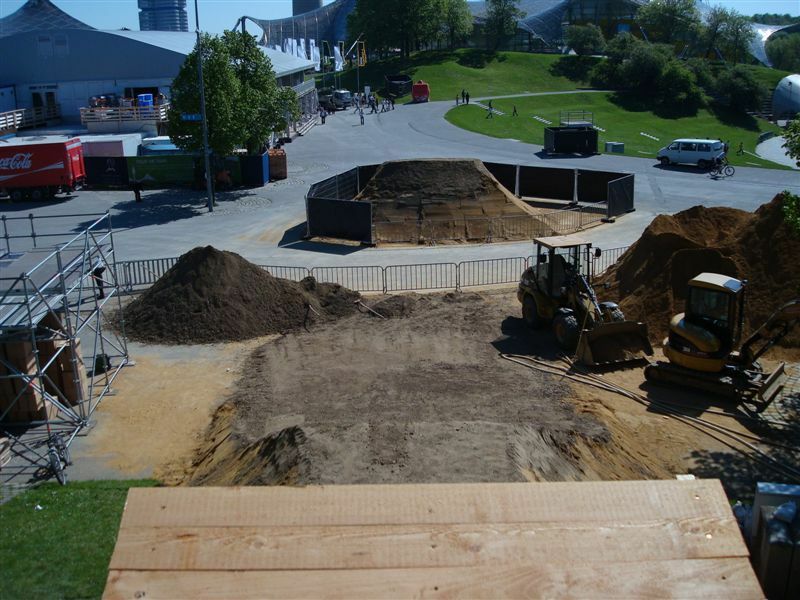 The weather is good and the course looks great, from the 6 meter high start ramp there are two 6 meter doubles, the second landing is into a 90 degree right hand berm which sends the rider down a grassy slope off a 10 meter long x 4 meter high drop, followed by a 10 meter double finishing with a poppy 6 meter trick jump. The construction team has built a huge wind block at the top of the course to minimize cross winds. Unlike the first two open events, Munich is a one day event. Only a practise session will be on Saturday and everything else goes down this Sunday, May 11th. The program starts in the morning with training and the first qualifying will start at 11.30am. After a little break the second qualifier will follow. The big final will be on between 4.30pm and 7pm on Sunday. With the 10 open qualifiers and 5 wild card riders joining last year’s top 15 elite riders, the start list is stacked and the depth of field is amazing. The 28 best riders in the world will be giving everything they have in the beautiful Olympia Park this weekend. The highlight of Sunday night will be the official Nissan Qashqai Challenge Rider’s After Show Party at the Ampere Club (Zellstraße 4, right across the street from the German Museum). The theme of the night will be: „From Dirt Till Dawn“. Thej night will be spot on, because the riders and fans will celebrate the successful day from 10pm on thru the night and the Boom Boom Clap Sound Systeme will enhance it all. Tai Jason will throw down some fresh Beatz and Ali A$ (Deluxe Records, Hamburg) is the man on the Mic.